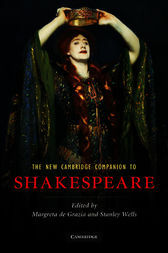 Written by a team of leading international scholars, this Companion is designed to illuminate Shakespeare's works through discussion of the key topics of Shakespeare studies. Twenty-one essays provide lively and authoritative approaches to recent scholarship and criticism for readers keen to expand their knowledge and appreciation of Shakespeare. The book contains stimulating chapters on traditional topics such as Shakespeare's biography and the transmission of his texts. Individual readings of the plays are given in the context of genre as well as through the cultural and historical perspectives of race, sexuality and gender, and politics and religion. Essays on performance survey the latest digital media as well as stage and film. Throughout the volume, contributors discuss Shakespeare in a global as well as a national context, a dramatist with a long and constantly mutating history of reception and performance.